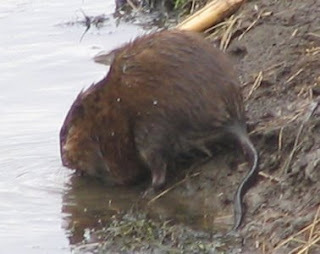 A large, brownish, aquatic, scaly-tailed rodent; feet and toes fringed with short, stiff hairs and toes of hind feet partly webbed; tail about as long as head and body, nearly naked, scaly, and compressed laterally; fur dense; eyes and ears small; upperparts brown to black, sides chestnut to hazel; underparts tawny brown, usually with a white area on chin. External measurements average: total length, 516 mm; tail, 240 mm; hind foot, 74 mm. Weight, (males) 923 g; (females) 839 g.
Occurs only in suitable aquatic habitats in northern, southeastern, and southwestern parts of the state. 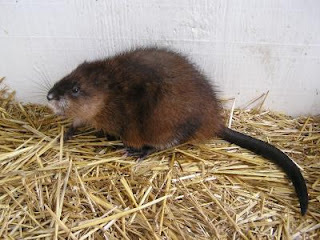 Muskrats are principally marsh inhabitants; creeks, rivers, lakes, drainage ditches, and canals support small populations in places where requisite food and shelter are available. In the interior areas shallow, freshwater marshes with clumps of cattails interspersed among bulrushes, sedges, and other marsh vegetation support the heaviest populations; in coastal areas, the brackish marshes that support good stands of three-square grass (a sedge, Scirpus) are most attractive. Such marshes with a stabilized water depth of 15-60 cm seem to offer optimum living conditions. 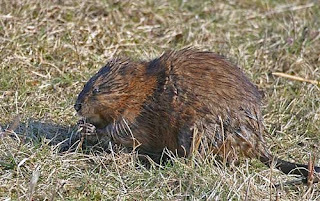 In marshes, the muskrats live in dome-shaped houses or lodges constructed of marsh vegetation. Access to the inner chamber usually is gained by means of two or more underwater openings, the "plunge holes" of trapper parlance. Such houses are usually 60 cm or more in diameter at water level, and project 50-60 cm above the water. They seem to be of two types: (1) those used for feeding only, in which case the floor may be submerged in water, and (2) those used for dens or resting places. 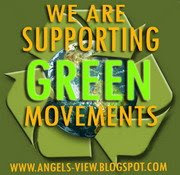 Frequently, several animals — usually members of one family — occupy one lodge. Conspicuous travelways radiate from the houses and lead to the forage areas. In canals, creeks, rivers, and so forth, where house construction would be out of the question, the muskrats burrow into the banks and live below ground. Entrance to such burrows also is usually by means of underwater openings. Dens that have been excavated were about 10 cm in diameter and 2-3 m in length and usually terminated in an enlarged nest chamber. The food of muskrats is varied, principally vegetation. Where available the tender basal parts of cattails and rushes are the main reliance. In the brackish marshes of Texas and Louisiana a sedge is the chief item on their menu. Normally, the animals have well-established feeding stations at the edges of travel lanes or in feeding lodges to which pieces of food are brought to be consumed at leisure. The animals are active throughout the year and store no food for winter use. 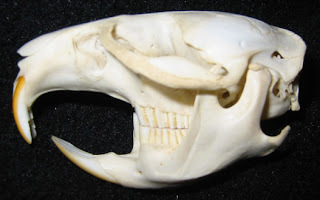 At that season, when nutritious food is scarce or made unavailable by freezing weather, the rats will eat almost anything, including parts of their lodges and nests, dead fish, frogs, wood, and so forth, or they may turn cannibalistic and prey upon their own kind. In southeastern Texas, the animals breed throughout the year. Breeding females produce two or more litters a year, ranging in size from one to 11 and averaging about six. The gestation period is from 22 to 30 days. At birth the young are blind, almost naked, and helpless and weigh about 21 g. The pelage develops rapidly and by the end of the first week the young are covered with a good coat of gray-brown fur. Their eyes are open in 14-16 days, at which time they can dive and swim with alacrity. When 4 weeks old they are generally weaned. Sexual maturity is reached in 10-12 months, at which time the rats have attained the size and characteristics of adults. Muskrats are the victims of many predators. Marsh hawks, large owls, raccoons, foxes, minks, water snakes, and large turtles are known to plague them. Muskrats were, at one time, the most economically important furbearing mammal in eastern Texas, but this is no longer true. The decline in importance of the muskrat as a furbearing mammal is a reflection of a loss of habitat as a result of marsh deterioration and resultant population decline, variations in market demand, and the increasing importance of the nutria as an important furbearing mammal. 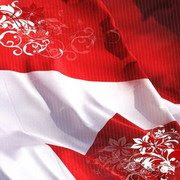 Btw Suka ma Hewan2 ya Mbak....?